ARTIFICIAL INTELLIGENCE (AI) is everywhere and it’s as big a dent in cyberspace as it is in the real world. According to PwC’s Global Consumer Insights Survey 2018, AI is making waves in the world of retail. 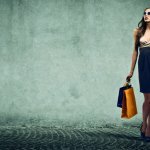 “In some ways, AI is the future of retail,” says the report. 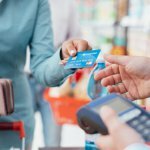 The report found that 45 percent of store operators intended to increase their use of AI within the next three years to transform their business, improving customer engagement boosting how customer insights are generated from social media. Globally, customers too are adopting AI tools in the home to improve their lifestyle and experience. 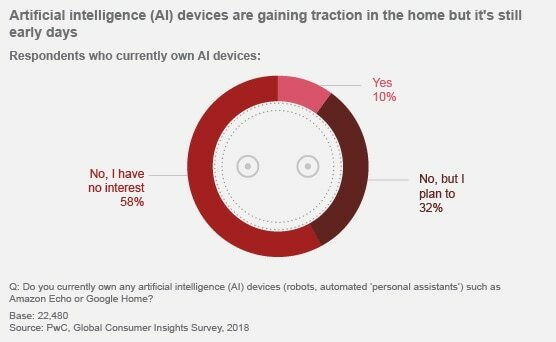 10 percent of those surveyed said they already owned AI-driven robots or personal assistants, while 32 percent said they planned to own one soon. 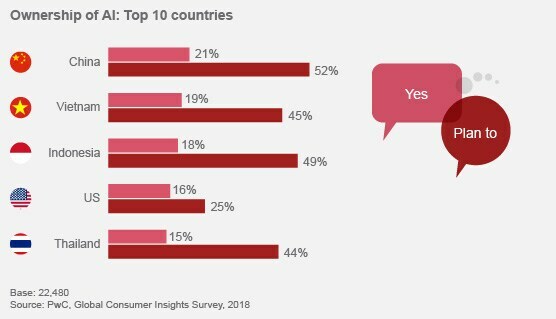 And although 58 percent of consumers said they had no interest in owning AI devices, the percentage was far smaller among emerging countries. However, among the consumers already using AI, expectations from and comfort with online shopping are high. We looked at our data several different ways to come up with a profile of an early adopter AI user. They are men, age 18-34, positive about both the economy and their personal spend, preferring mobile payment, open to collaborative consumption and buying in bulk – said the report. 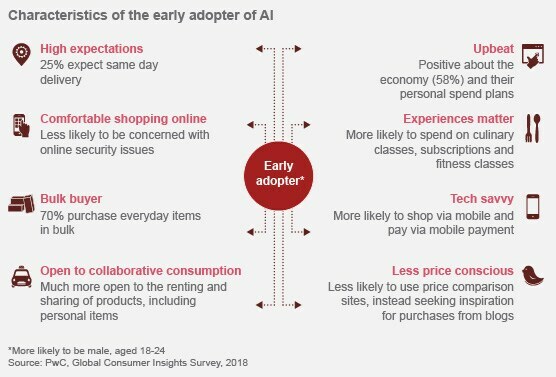 What’s interesting is that 25 percent of AI early adopters surveyed said they expected same-day delivery (of merchandise purchased online) on a regular basis. Further, the survey found that Asia leads the globe in the adoption and ownership of AI devices. A general preference for voice interaction and lower levels of concern about online privacy helps many Asian nations surge ahead of many of the developed countries around the world. In China, 52 percent of citizens plan to buy an AI device. The story is similar in Vietnam where 19 percent own one and 45 percent plan on buying one soon. In Indonesia, 18 percent own already and 49 percent on acquiring one shortly. And in Thailand, the figures are 15 percent and 44 percent, adding up to 59 percent of citizens looking to engage with an AI device soon. In fact, it’s not just AI that is winning over consumers. Manufacturers are also developing a new generation of tools ranging from smart refrigerators equipped with a touchscreen to monitor an entire connected home, to apps that use augmented reality to let customers virtually try on clothes and make-up. Consumers too seem to be willing to try new things. 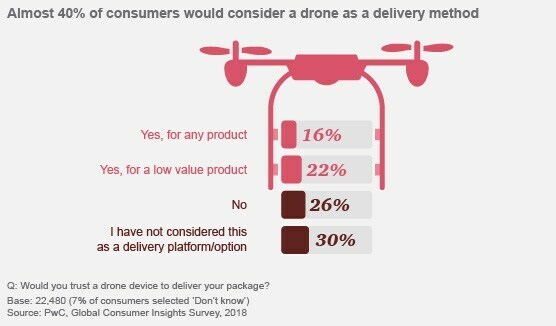 According to PwC’s findings, for example, 40 percent of respondents said they would consider a drone as a delivery method. 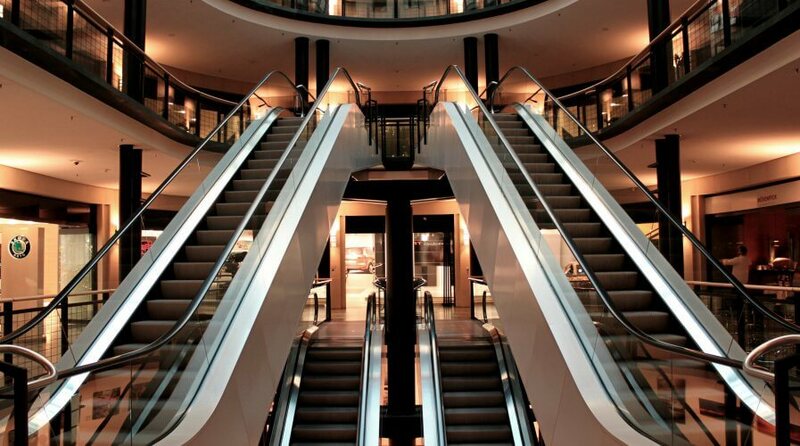 However, although technology adoption is on the rise, customers aren’t deserting malls anytime soon. In fact, visiting malls is on the rise and people seem to be thinking of it more as a sensory and social experience than as an activity or errand. 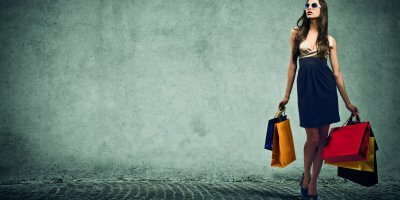 In fact, in-store shopping is at an all-time high of 44 percent, compared to 42 percent in 2013. But that doesn’t mean mobile-commerce is declining. People have been increasingly making purchases on mobile devices and tablet computers. 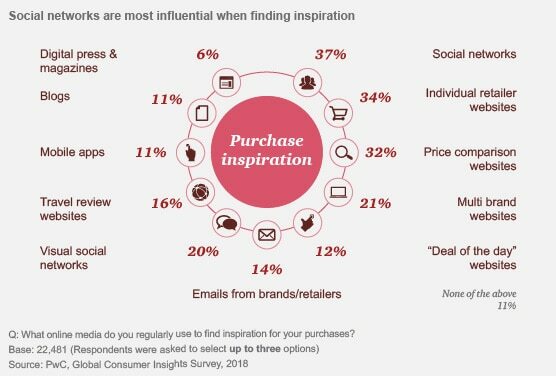 However, when asked what inspires respondents to make purchases, social networks, individual retailer websites, and price comparison websites ranked highest – each preference receiving north of 30 percent votes. Blog posts, deals of the day websites, and emails from brands and retailers, respondents said, were least inspiring. 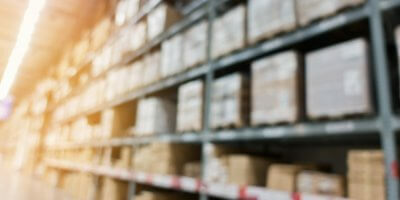 New consumer habits offer an opportunity for savvy retailers and manufacturers. 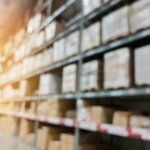 According to PwC, these companies can now reduce their on-site inventory and free up space for a more engaging showcase of their products, offering brand-complementary activities. And thanks to the ubiquitous smartphones, these investments may not be so capital-intensive. Instead of making room for sizeable in-store video screens, for example, stores can instead invite shoppers to access videos on their smartphones from the cloud. Ambitious retailers can go further and offer virtual reality, but this trend is still moving slowly. 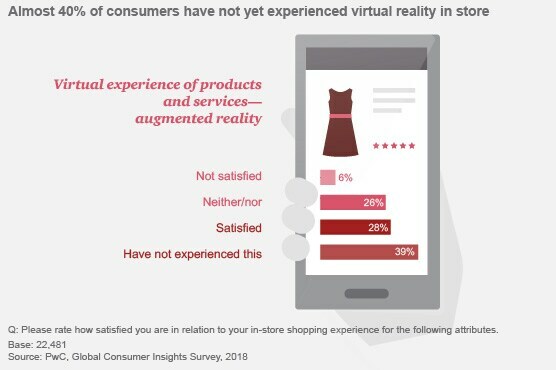 The survey revealed that 39 percent of them had still had not experienced this technology in stores, and of those who did, only slightly over half were satisfied. Companies should respond to these new consumer habits by shifting their focus and investments accordingly. 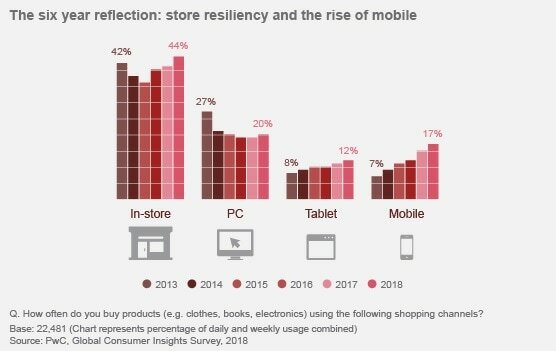 That means more attention to smartphone dynamics, as well as investments in AI and store experiences. 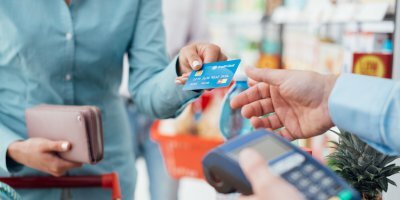 PwC believes that new business practices to support these investments can help companies go with the flow of new consumer behaviors, rather than fight the current.